Fill in the application template to apply for an exhibition booth at the AAL Forum 2019 Exhibition. AAL Forum 2019 THEME: Smarter practical implementation of digital technology to enhance active and healthy living. The exhibitors are allowed to present no more than 2 products in the exhibition. The products on exhibit have to be relevant according to the theme. Therefore, exhibition applications must contain a detailed description of the products that will be exhibited, so that the organisers may evaluate the relevance of the product. If a product is not considered relevant, the organisers reserve the right to reject the exhibitor or the product. There is room for up to 90 exhibitors that are accepted by the organisers. Once an exhibitor is accepted, the organisers will send an invoice and a template for at detailed description of the product(s) of the exhibitor. This description will be used on the web page of the AAL Forum 2019. Radisson Blu Scandinavia﻿ will be hosting the AAL Forum 2019. The exhibition will take place in the adjacent Scandinavian Congress Center. Everything right in the centre of the beautiful city of Aarhus﻿, Denmark. 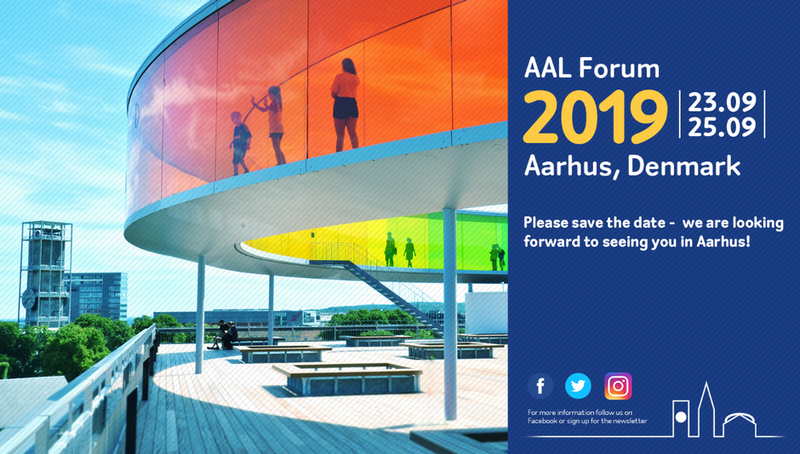 The AAL Forum dates are from Monday, September 23rd until Wednesday, September 25th 2019. The exhibitors can set up their exhibition stand on Monday 23rd - and the exhibition stands have to be ready by Tuesday 24th at 9.00. The AAL Exhibition is open Tuesday 24th from 9.00 to 18.00 and Wednesday 25th from 9.00 to 17.00. The exhibition will be visited by the European AAL Conference participants on Tuesday and Wednesday, as well as the national Danish Rehabilitation Forum participants on Wednesday. These visits will be organised as guided tours in groups with a guide. In the guided tours, each exhibitor has a fixed time to pitch his product(s) and get feedback and questions from the group of visitors. Apart from that, the exhibition will be open for the public and any other interested parties in the afternoons during the two days. Power 220V, at least 2 sockets. AAL Project: 6,300 DKK (~840 €). ﻿AAL Project Fee is only applicable for an Active and Assistive Living (AAL) project. Please identify the project in the online registration form. The price will be in DKK, and the invoice that you will receive will be in DKK. Fees are inclusive of VAT (25%).